CHICAGO - Imagine sitting on your porch or apartment stoop and a caravan of several Black Chevy Suburbans and Hummers roll up. A security detail and group of 40 to 50 Black men in suits walks down your block. As the group gets closer and closer, some men are carrying copies of The Final Call newspaper. “How are you doing?” asks a man with a smiling face and outstretched hand. The man speaking is the Honorable Minister Louis Farrakhan of the Nation of Islam. 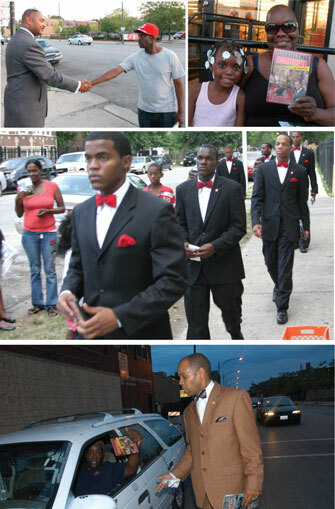 Dozens of residents of the city’s Auburn-Gresham neighborhood on July 16 and South Shore neighborhood on July 23 had that experience as the Minister led the Fruit of Islam into South Side streets and hundreds of other Muslim men fanned out across the country in over 100 cities in efforts to bring peace and hope to violence-plagued neighborhoods. Minister Farrakhan greeted young men and women with words of strength and encouragement, while many have written off these people and their neighborhoods as problems society cannot solve. Traffic ground to a halt on the busy 79th Street, as people showed genuine love for Minister Farrakhan and the Nation of Islam. Waves came from apartment windows. Car horns honked approval. Drivers gave thumbs up. Teen girls stopped Tweeting and FaceBooking for a minute to snap a photo with the Minister on iPhones. Additional teams of F.O.I. visited other hot spots, greeting people, handing out copies of The Final Call newspaper, and speaking words of peace. They also handed out copies of the 1995 Million Man March pledge, which was an oath to be peaceful builders and to respect self, families, women and communities. Words of peace and progress and an open invitation to visit Mosque Maryam, the Nation’s flagship worship center, were extended. As the Minister did his work, thebrothers, dressed in suits and trademark bowties, did theirs in other parts of the community. Robbie Jones, 49, was in tears after meeting the Minister. Through her tears, she told The Final Call her uncle was a member of the Nation of Islam and encouraged her to listen to the Minister. She had never seen Min. Farrakhan in person. “It was something great because we don’t really get people in our neighborhood that really care about people around here. It’s just a blessing,” she added. “I was happy to see him,” said Ms. Goree. “It’s a beautiful thing. We need somebody else out here that’s going to help us because the police out here, they don’t care,” she said. Both women said violent crime is getting worse but believe young Black men want honest work and recreation. But, the women said, with no jobs and no place to go, they hang out, get harassed by police and get in trouble. Keon has lived in Chicago for the entire 26 years of his life. He called his neighborhood “a war zone” where rival factions of street organizations compete for dominance. “I think it is a beautiful thing for the Minister to come on these rough blocks to show the support that he did—it might make a change,” said Keon. Latasha Thomas, alderman of the 17th Ward, represents the area visited by the Minister. She worked with the logistic team giving Minister Farrakhan information about danger zones. Problem areas were communicated to the Minister, who went directly to trouble spots, she explained. Ald. Thomas watched Black youth respond to Minister Farrakhan’s presence and words as he spoke without condemning them. “He makes them believe, and if we can get them to believe there is another way, that’s where it is,” she added. 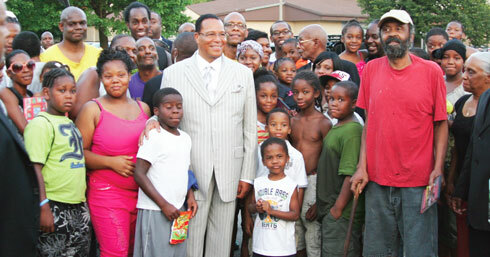 In the blighted area of the South side known by many as “Terror Town” Minister Farrakhan again reached out and touched the people. Shirtless young Black brothers, wearing baseball caps with pants sagging, one with a tatoo on his chest reading “Young God” talked for quite some time with brothers of the F.O.I. that were the same age. “This might be considered a life saving movement, not only resulting in the reduction of crime, but saving the lives of men that otherwise would be cut down in their ignorance by members of the law enforcement community,” said Leonard F. Muhammad, longtime aide to Minister Farrakhan. Leonard Muhammad worked with law enforcement, political and community leaders to coordinate the massive effort. “It is said that ‘Islam comes after all else fails.’ And the reason there is so much joy being expressed, not just in the community, but all across the country is because all else has failed,” said Leonard F. Muhammad. The Chicago district police commander told him that there was no crime in any of the places the F.O.I. visited that evening, he said. The F.O.I. demonstrated crime can be reduced without the “heavy-handed tactics” often used by police, Mr. Muhammad said. In the United Kingdom, Hilary Muhammad, the Nation of Islam’s representative, regularly goes out with the UK edition of The Final Call. It has always been Minister Farrakhan’s way to engage the people on the street, harking back to his days as a young student minister in Boston and New York, he observed. Three busses filled with Muslim men rolled to different violent hot spots with members of the Student Ministry dispatched in pairs. Abel Muhammad of Mosque Maryam, who is of Mexican descent, walked the streets with one group.They didn’t encounter many Spanish speaking people, but were received with open arms. None of the so-called Black-Brown tension was evident during the N.O.I. operation. “It represented a watershed moment in the Nation of Islam as well as America,” said Marcus Muhammad. “The book of Isaiah says that ‘we will rebuild the wasted cities.’ Before the wasted cities can be rebuilt peace—Islam—and security must be established. I think that we are looking at the initial phase of this awesome task,” he said. “It was a small glimpse of our potential and a reminder of our duty. The spirit was so high, it felt like a rebirth,” added Abel Muhammad.